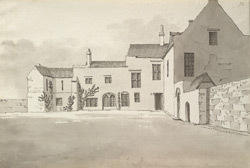 A view in ink of Mr Egerton's house at Wearmouth in Durham (now in Tyne and Wear). Mr Egerton was possibly connected with Grimm's patron, the Rev. Bart, and Grimm may well have been accommodated in this house as he made his sketches of the local area.